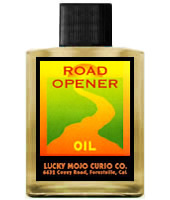 What exactly is the difference between Road Opener Oil and Van Van Oil? Road Opener clears blocked passages and opens the way, Van Van says it cuts clears messes and ties to past events. So does Van Van get rid of tricks you laid down or is it just the same? Van Van says to open the way, I know it is mostly used to anoint charms like the lucky rabbit foot but is it pretty much the same as Road Opener too? Any info would be nice, as I want to make a decision on the matter. It sounds like you have delineated them pretty neatly to me. Road Opener opens the road for you by clearing away any obstacles. Would it be OK to add a drop of Road Opener oil to a candle already dressed with Banishing oil? The intent is to clear away obstacles, and I think one of the ingredients in Road Opener is lemon grass, which is awesome for clearing away negativity. Banishing Oil is used to remove people or, more rarely, situations, from your life. It is not at all in the same family as Road Opener Oil, which is to knock down obstacles and open your path with opportunities and clarity. Say you are banishing an ex-friend -- don't want them to come by your house anymore, don't want them leaving messages for you. You use Banishing Oil to drive them away. Now, why would you use Road Opener on that? To open their roads and invite them back into your life? -- BAD idea! To open your own roads? -- but the candle was on THEM, not on you, so this makes no sense. Therefore, no, i would not mix those two oils under those circumstances. To open the road for obstacles and invite them back into your life? -- BAD idea! To open your own roads? -- but the candle was on OBSTACLES, not on you, so this makes no sense. I know some workers who if they are doing something like a Break Up candle or a Hotfoot may use a Road Opener to clear away the obstacles towards their goal of the break up or the hotfoot. Would you advise against using Road Opener products in such situations as well, if you are targeting the idea of clearing out the obstacles towards your work? I lit a black candle with Banishing oil with the intention of breaking up old conditions and banishing discord between me and a family member. With the waning moon, I thought this would be an opportune time to get rid of problems between us, then use the waxing moon for healing by burning blue candles with Peaceful Home and Healing oils. Did I mess up by using Banishing oil for this situation? I generally work on people over conditions. If you burned the candle on the discord, then no, you can technically work that way. If you burned the candle on the other person, then you aimed the banishment at them. For the other part, you are mixing a home blessing type oil with a healing oil (generally for people). Depending on how you targeted the candle, this may or may not have the effect you want. It's never really bad to propigate either of these feelings, though. I recently did a figure candle for my boyfriend, separated from me at the present time, and on it I put uncrossing oil to end the crossed condition, and road opener to get rid of the obstacles and open the road for him to come back to me. Good or bad? (Just did it last nite as part of an ongoing work that I'm doing step by step). Was your boyfriend the target of the spell? Did you have a petition paper? How do you know he was/is crossed? The advice given in the other responses applies here as well; rarely do these formulae work together. A more traditional family to use in this case is Return To Me. Separate work could be done to uncross, cleanse, and protect your boyfriend. In my experience it's best not to mix or add too many oils or ingredients to a spell. At least not to begin with. I start with the least number of products and the simplest spell. I use a candle, an oil, an incense and a prayer and most of the time that does the job. Sometimes I make a mojo hand to go with it. If I feel like it's something that will take more effort, I use a LM spell kit which are quite involved and have a lot of steps to them. Those work great. But, I'm a firm believer in keeping it simple. I think I may have used the uncrossing oil inappropriately - my intent was to end the mixed up mess between he and I and open the lines of communcation. I did a petition paper, I wrote his name nine times and mine crossed over it nine times, and around the names I wrote open the way to return to me, nothing in our way, the road is open to reconcile, nothing prevents you from returning to me. I try to work with the moon unless its an emergency, so I was going more along the lines nothing being in our way (no outside influences) to prevent us from taking the first stepsto reconcile, i.e., talking about our issues. I've done some return to me work earlier this month and will step it up a bit later this month. After that was done, I did see him and we've been talking on the phone, but I know I need to keep up the pressure. I'm not repeating spells per se, just doing different types of work. For example, tonight I will be doing glass-encased candle strictly with the intent of communication between us. I like to use glass encased candles for a dual purpose, both the work itself and I think that its easy to see how a working is going (mine generally are spread out over time and take a lot of work, I hardly ever start until there's a serious problem lol) by the way the glass candles burn. OK, crossing/being crossed is a fairly specific condition in the hoodoo tradition. It's very interesting, and Miss cat has a page on it here: http://www.luckymojo.com/uncrossing.html Now you've learned something new, and that's never a bad thing. Your petition paper sounds good; you don't say, but the words around are traditionally written all connected and without lifting your pen. It also falls in line with your use of Road Opener oil. As an additional note based on what you have written, I will say that doing 'stand-alone' spells is not the only option you have. Many workings in hoodoo are done for a number of days, or a more ceremonial spell followed by candles, or done constantly until results are achieved. This may help where you say, "I've done some return to me work earlier this month and will step it up a bit later this month" and "I'm not repeating spells per se, just doing different types of work". I would recommend re-doing the Road Opener spell, leaving out the uncrossing oil. Other than that, you seem to have a general grasp of the work. Good luck! I would not use a Road Opener on a person that i was Hot Footing unless i saw, by reading the candles or wax remains, or by another form of divination, that there WERE obstacles -- but even assuming that there ARE obstacles seems like second-guessing your own work, in my opinion. I play for keeps, and my Hot Foot spells are TOUGH. I don't need the person i am Hot Footing to have their roads opened -- they RUN LIKE HELL,- and if there is no roadway for them, then they will just have to run over briars and brambles to get the hell out of my way! Ah, Miss cat you are a woman after my own heart . I had heard of using Road Opening in such an occassion, but I always thought it a bit odd. Hotfoot should be as you eloquently put it making them "run like hell" so bad that they literally jump over those obstacles . I did write the words around the names on the petition paper without lifting the pen. I'll do another one tonight using just the road opener....thank you for the suggestion! Lynda wrote: Your petition paper sounds good; you don't say, but the words around are traditionally written all connected and without lifting your pen. It also falls in line with your use of Road Opener oil. which oil is techically more "powerful"? i need some obstacles removed concerning my ex. or for lack of "powerful" which is a better choice in a matter like this? This recent post should answer your question. wow thanks! that answers everything just perfectly. how did i miss that post? In my experience, be sure you are willing to accept what roads are opened for you when using the road opener supplies. The obstacles that are removed could be things you were used to and actually liked (boyfriends, family members, neighborhoods, etc.) and they can be taken away in a manner that does not necessarily SEEM like it is for the best until you see where it leads you and what path is opened up. To a certain extent I agree with you heathernijoli< but I think it's more of an issue of focus and intent. In certain magical teachings you'll come accross an axiom that states: "To Will, To Know, To Dare< To Keep Silent. ", and I think as it pertains to this issue it is very relevant. When you open the door and ask for the universe to open the way for you, how can you expect it to open the right door, if you yourself aren't clear regarding which door it is you'd like opened or what it is you want. Learning to formulate your petition/prayer is as important than actually knowing which herbs and condition formulas to use. If you don't know and can't express/articulate what it is you'd like the universe to do for you through your workings is it any surprise that you get garbled results. It's kind of like telling your mate that your hungry and they bring you a granola bar when you really wanted a burger and fries, and then you get all upset over it because they didnt bring you what you wanted. How can you be upset at them if you don't tell hem what it is you'd like, your mate can't read your mind, neither should we expect the universe to. That was an excellent explanation Sebastien. We definately get what we ask for. Details are important. im having one of those moments.. im not sure which way to annoint road opener oil. i want to remove obstacles so that should mean i annoint it from wick to base right? Thank you much Stars. now ill never forget how to use this wonderful oil. its got a very pleasant smell too i may add. Ive done some break up work on two people recently and apparently there are numerous obstacles. I've been having some break up vigil candles lit as well as some crucible of courage/wisdom/clarity vigil candles for each party to have the courage to walk away. As a supplement to the work I had done on my own previously. However there are still some blocks and obstacles...and while they argue, they dont fully separate. If applied as a supplement to clearing the obstacles that prevent them from breaking apart, I wonder if would road opener appropriate? but Im still unclear about using it in addition to a break up candle. If applied to remove the obstacles the people are facing. And also, If it is appropriate, would two road opener candles be required? one for each parties own obstacles they face that prevent them from walking away from eachother? If there are factors keeping the couple together then address those factors. For example let's say they are staying together because of living arrangements then make them loose the house or hot foot them right out of the property. Eliminate those obstacles. I find that if you create enough stress, tension, and fighting then no matter what obstacles there are people will leap to break up. Thanks Conjureman. They do not live together. I think these obstacles circle around emotional ties and obstacles that keep them together. And not so much physical as multiple readings form an AIRR reader have indicated that they arent even intimate and havent been for years- which one party confirmed. They have mutual friends gunning for them to be together, and a long history together, so this is mostly out of comfort. Thats why I was wondering if Road opener would attack these obstacles too. wasnt sure if when using road opener, one had to specifiy the obstacles if they didnt know them? Its hard to really pinpoint emotional issues and what the real blocks are as typically there are many layers. Im thinking maybe a reading could confirm what these emotional obstacles were for both of them? and then maybe using road opener from there after I have some more insight to what they are. In theory though road opener would be able to remove these emotional blocks if they were specified though? ok road opener or van van incense.. both are said to open the way. i know that road opener incense is for as the name implies only whereas van van has more purposes to it. can i use van van incense for a road opener spell? Personally, I feel like road opener opens the way BUT it REMOVES obstacles. Van van opens the way, but does not necessarily remove the obstacles or crossed conditions from the past. Van van is great for turning situations around much like an ammonia jar. It is used for amulets. So lets say you had been crossed up. You did an uncrossing spell kit which takes the jinx off, but may not necessarily remove the blockages put in your way from the past. So that is what you would use the road opener for. You can use a van van as well to help turn your luck around in this situation too. But when you think about road opener think about removing obstacles, and just past garbage from having bad luck. Well that settles it for me right there Stars.. road opener it is!! as it really does more of working towards my goals. it kinda makes me wish that LM has the option of ordering something like incenses that can be combined like the do with that rootworker oil special. or better yet.. if i had enough money to buy 2 of each item that LM sells. Thank you for helping me make a decision Stars as you are most helpful as always. Van Van is definately a cleansing agent and removed blocks. In fact this forumla was used widely for anything from removing obstacles, clearing up messes, changing luck, dressing talimans and much more. The difference is that they have similar intents, but Van Van is more versatile. Oh man... decisions decisions lol. Im havng a hard time deciding which one id like to order. what i really want is something that removes obstacles from both past and present. Does anyone know if hindu grass is in either of these incenses? as im not familar with either one can someone decribe the scents of these two? then go into the search... scroll all the way down and type in...there is a wealth of info here!!! Van Van oil is like the old slogan for American Express, "You never leave home without it". Both are wonderful, as Starsinthesky7 recommended, Road Opener Opens Ways, jwmcclin recommended a "mixed dozen" (I have ordered this and it was the best purchase I have ever made) and Brilliant Conjurman Ali from AIRR says that "VanVan is more versatile". Totally agree! Personally I LOVE VAN VAN-- its a must have. Hope this helps. Order the mixed dozen!!! Get them both!!! -a job doing a credit check on someone with bad credit? I could be wrong here but just looking at what you wrote I am not sure Road Opener is applicable based on how you are phrasing your questions. For the job thing, the way it's stated you want the job to do a credit check if the person has bad credit, assuming this company would not hire someone with bad credit...you certainly don't want to open the road for them to view the credit report. You would want to do something that would either make them overlook the bad credit or to consider you a strong applicant regardless. Perhaps Crown of Success, Fast Luck, or Steady Work. For the last one you would want something like Stop Gossip as opposed to Road Opener, you want to shut them up and keep them from saying negative things. I mean I see where you are getting the idea for Road Opener since these are past issues (as far as the credit report and the gossipers) that could be causing current blockages, but I don't know if using Road Opener on it's own would solve the issues as you have them listed here. As always..my disclaimer that I am not an expert or practitioner....so this is just my thoughts based on explanations from Miss Cat and other workers on the uses of these oils. Well in the 'description' for road opener it says "To break old blockages and open the way for new opportunities "
I've actually been using Crown of Success, Fast Luck, and Steady Work. I don't have Road opener, but I did have a vigil candle in road opener lit on my behalf. Read through the entire Road Opener page. Notice how it says "stuck" and "devoid of forward movement". To me, the fact that a prospective employer is running a credit check says that you do have forward movement, it just hasn't come to fruition yet. I find that dressing paperwork with Law Keep Away sachet powder goes a long way in letting things slide through the bureaucracy without much complication. You might consider using it together with your Steady Work products. Trish76's suggestion of having a professional work out your resumé is a great idea. I also agree with her suggestion of using Crown of Success products, and I would also add Look Me Over or Attraction products so that your resumé receives lots of favourable attention. And finally, her suggestion of Stop Gossip is spot on. I never thought about getting 'law keep away' products. I wish lucky mojo would accept paypal. Whenever I have money (I sell on ebay) to buy stuff, I have to wait 4 days before it's in my account & by the time it's in my account, I have to spend it on something else. On March 5th I did a road opener spell for an apartment in a specific location to become available for my mom's elderly friend who had been waiting years for a new apartment with social housing. Because she is in her seventies and has hip problems she needed a downtown apartment where there is good transportation. Prior to that she kept getting offers that were on the edge of the city where buses don't run after 5pm. The same evening that I did the spell I was watching the news and the reporter mentioned "opening roads." It is now June 5th and this morning I learned that she has now moved into her new apartment in the center of the city. Thank you LM. This is inspiring thanks for sharing and congrats! Exactly 3 months to fruition too, awesome. @ Sebastien: Thank you so much for your explanation, it hits the nail on the head. It´s not enough to say: "Everything should be better. ", you have to take responsibility for your life and its directions. While I do agree that specificity in petitioning is important - as others have so aptly described - as pertains to road opener work; my own opinion is that leaving some room in petitions for events to take the shape that Spirit decides they should can lead to unforeseen circumstances that are often a more beneficial overall outcome that the one(s) I could've/would've anticipated. The human mind is incredibly limiting in that we will only ask for or describe situations which we can imagine, grasp and/or comprehend. Furthermore, there is often a significant margin between what we want, and what we genuinely need. Spirit on the other hand, seems to know what experiences and paths any specific individual needs for their own growth and fullfillment: some learn by watching a flower grow, others require the 2x4 in the face method - and Spirit will provide whichever needs be! I agree with what you said aura! I especially see this take place when someone lights a Road Opener candle or does Road Opener work and is shocked and confused by a seemingly non-Road Opening result...only to fully understand a month later when that very result ultimately OPENED THE ROAD more than they had thought. Interesting thread this has turned into! I think both sides have to do their job - the divine and the human. Of course it´s not just: "I want to have this or that.". One has to be open, because - yes - human mind is very limited compared to divine guidance, but one also has to be clear about the essential direction. @ Joseph M.: Thats true, especially works to open the road can be very surprising first, but totally logical in the end. trying to figure out which would be best removing obstacles without anything tragic happening like i dont want to lose family members, pets, etc. Would i specify that in a petition? I know Van Van is used to turn bad into good situations and Road Opener removes obstacles, so would i need to do Road Opening work before using Van Van? I would...considering Van Van does much more! My daughter is a high-school senior. She's been having a rough year and has been under a lot of stress. Because of the stress, she was falling behind in school, lost her boyfriend, and nothing seemed to bring her pleasure anymore. I had a talk with her and she kept saying how hopeless she felt, like there was no future to look forward to. I offered her Cast Off Evil Oil and Road Opener Oil. She picked the Road Opener. I think she only wore it once, but within two days, she decided on her own that she wanted to see a psychiatrist about anti-depressants (which she previously resisted). She has started hanging out with her friends again and getting her homework done, and is upbeat about the future. Road Opener truely opened a way into a solution to her problems for her! Terengo: Thank you so much for that feedback. I am a huge fan of Road Opener work, as I have seen it work wonders for others and have worked it very successfully for myself. Good of you to pick the Cast Off Evil and the Road Opener oils and to have let your daughter pick...that was a wise move! Most people are more open to change if it is presented as something that they are picking and putting into motion and not something forced onto them. I could also very much see a teenage girl picking Road Opening over Cast Off Evil...I would have too at that age! Thank you for sharing that inspiring story! I wish you and your daughter continued success.